Imagine you are nine months pregnant and today is your due date. You are only 19 years old and having your second baby. You suffered from violence at the hand of your husband before and during the pregnancy. Thankfully, with your own strength and the support of your parents, you managed to leave his home and moved back in with your own family. Despite these struggles, you have still managed to make it to your prenatal appointments with the ACAM midwives. Like clockwork, you go into labor on your due date and arrive to the birth center with strong contractions. When you arrive to the clinic, however, the midwives can’t find the baby’s heartbeat with the doppler. They bring in the ultrasound machine, locate the baby’s heart, and discover that it is no longer beating. Nonetheless, the contractions are getting stronger and closer together: the baby will soon be born. This was Elsa’s reality today as she arrived with us at ACAM. She was one of our patients who received prenatal care at the mobile clinic in La Victoria, a surrounding community. As we delivered the news, she winced through increasingly intense contractions. I imagined her profound emotional pain compounding the physical pain surging through her body. I started to discuss the plan for Elsa with Nancy and Imelda, the midwives on call. We had no doubt that she would continue dilating and that she could deliver the baby normally. We hoped that we could keep her at ACAM for the delivery where she would receive compassionate care. However, I checked her blood pressure and my heart sank as I saw the reading: 150/120. There’s no way we can keep her, I thought. I rechecked her blood pressure a few minutes later it remained the same, very elevated. She likely had preeclampsia and needed a higher level of care. Her undetected condition may have been the cause of her baby’s death. We told the family that we needed to transfer her to the public hospital. Although they appeared worried, they ultimately agreed. “They don’t kill people there, do they?” asked Elsa’s mother in Mam. Her question was sincere. Nancy, Elsa’s mother and I rode with Elsa in the ambulance to the hospital. Elsa was breathing hard through contractions as we bumped along the road. I began rehearsing what I would say in my mind once we arrived at the hospital. Typically, the doctors don’t allow anyone to enter with the patient— even when they are in labor. We arrived to the hospital and wheeled the patient toward the Labor and Delivery Department in her gurney. I felt a pit in my stomach because I knew we were heading into the lion’s den. “Who are you?” asked the receptionist. “I’m her doctor,” I told the receptionist. I cringed a little at my own exercise of white privilege; no one would question that I was a doctor. I wasn’t going to take the time to explain the complexities of a nurse midwife’s role. If I had said midwife, they would be unlikely to let me through. Now we had one nurse’s attention at the front desk. “Who’s she?” asked the nurse as she pointed to Nancy. “I need to her to come with me. She’s my translator and this patient doesn’t speak any Spanish,” I said truthfully. “Ok, but that’s IT!” they said emphatically. The nurse made a joke about how she couldn’t even say hola or adios, as if to mock the importance of the fact that the patient can’t communicate well in Spanish. Elsa’s mother stood at the edge of reception, anxiously watching her daughter in profound pain. She looked small and vulnerable in her tattered clothes, the love and concern of a mother palpable in her expression. As we walked over the threshold from reception to labor and delivery, I took in a large room filled with pregnant women. There must have been at least 40 patients either laboring or awaiting an evaluation for a prenatal concern. Groups of young medical students and residents stood huddled together talking. There were no attending OB/Gyns, no nurses providing labor support, or any form of continuous fetal monitoring. “Change her into a robe and get her on a bed,” said the nurses as they walked away. We got to work changing Elsa’s clothes. I motioned to her mother to come in and stand by me because the doctors were distracted and disinterested at that point. Elsa’s mother scurried over to me. Elsa was now standing in a hospital gown by the narrow, sheet-less gurney that they told her to lay in. It was too high up for a small woman to jump up into, much less a small woman in hard labor. We looked around for a step and contemplated a way to get her into the bed. Several minutes had passed and I could see the telltale signs of Elsa entering the transition phase of labor: 8-10 centimeters dilated. I wanted to check her dilation, but feared getting physically kicked out of the hospital if I stole their gloves and started to take care of the patient myself. Instead, I approached the group of medical students. “Someone needs to evaluate my patient or I’m going to check her myself,” I told them. One of them ambled over. “Why isn’t she in the bed?” she asked. I gave the student a report of the patient’s fetal demise, her blood pressure, her last dilation measurement before getting into the ambulance (6 centimeters), and the dose of Nifedipine I had given her about thirty minutes earlier. She appeared to be in a trance. I handed her a sheet where I had also written down all of this information, but the student did not seem to be processing any of it. She put on a glove, checked Elsa’s dilation and said she was still at 6 centimeters. She asked how we knew the baby was dead. “We diagnosed it by ultrasound,” I said. Who did the ultrasound?” she asked. “I did,” I responded, getting increasingly annoyed. Suddenly we were bombarded with questions. “Who are you? Why do you have an ultrasound? Where are you from?” She seemed to be more interested in interrogating us than evaluating the patient. Regardless of my responses, she ambled over to get a doppler and began trying to find a heart-beat. She looked all over the patient’s belly, while I was biting my tongue. “You’re not going to find anything,” I thought. “When was her due date?” She asked. “Why didn’t you come in sooner?” she said stupidly to the patient. At least in that moment, I was glad the patient didn’t speak much Spanish. What a time to scold someone. The resident took the patient’s blood pressure and it had gone down a little to 140/100, probably as the medication had kicked in. Still elevated but not emergent. She told us that the patient would be going for an ultrasound to diagnose the demise. This was understandable to me as they can’t simply make a diagnosis based on our spoken report. “Now you all need to go outside,” she told us. Imagine you are Elsa again. You are in a large room full of medical students and residents who don’t speak your language; you are in the worst pain of your life, unable to get down from a high narrow bed; you are in the room with dozens of other women, many of whom are also in labor; you are about to go through one of the most difficult experiences in your life and your mother cannot even stay to hold your hand. The only people in the room who can advocate for you are being kicked out. “Outside, outside!! !” she reiterated to all of us. I grabbed Elsa’s hand and squeezed it, trying to send all the love and strength I could muster through my hand to hers. She looked pleadingly at us as we walked away. I prayed that she would come through this experience okay, knowing that the scars of psychological trauma during labor and birth can impact a woman forever. “No, you cannot!” the nurse yelled. I must be in some sort of nightmare, I thought. This cannot be real medical care. But having seen it with my own eyes, I know that it is true. This is the level of care for people who can’t pay for private doctors and hospitals, which is the case for the majority of people in the world. Since arriving at ACAM, I have often been frustrated by patients who risk their health, or even their lives, by refusing to go the hospital when referred. However, today’s trip to the hospital gave me a deeper and more visceral understanding of what it feels like to be treated with such lack of respect and such disregard for emotional and physical pain. I better understand the authentic fear that exists within patients, which these medical providers not only neglect but potentially harm. I do not mean to convey that every Guatemalan doctor is incompetent or ill-intentioned. For example, our own doctor at ACAM, Dr. Valeria, came out of the same system and is extremely compassionate. She has chosen to work side by side with midwives and strives to strengthen them instead of tear them down. However, these young doctors are underprepared, ill-equipped, overworked, and have been raised in a culture of paternalistic medicine. They are almost exclusively Ladinos treating Mayas. The power dynamics are heavily weighted against the poor and uneducated. It is the doctors and nurses, like Dr. Valeria, who are brave enough to speak up against discrimination and challenge the status quo that are ridiculed or mocked. 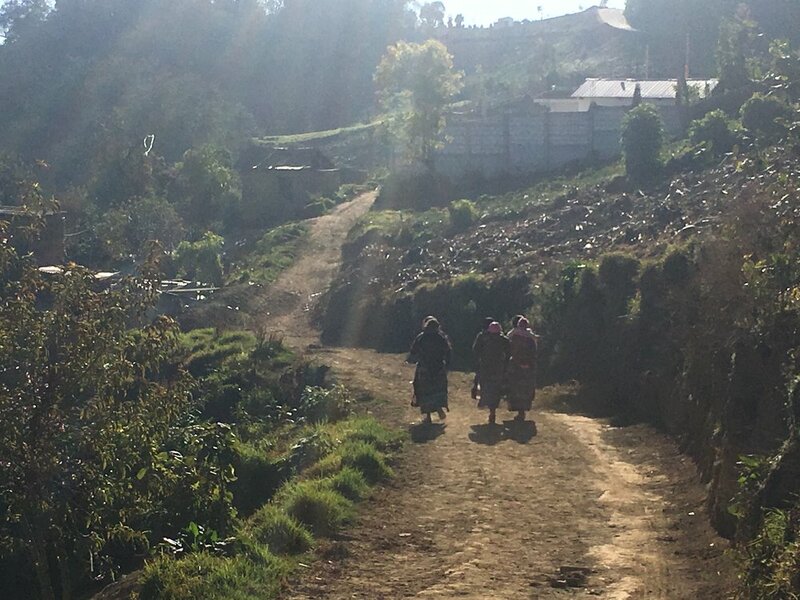 When I got home to ACAM, I reflected on the broken Guatemalan healthcare system. In a country full of corruption and deep-seated racism, it’s no surprise that the government health system does not serve the poor well. It is a systemic failure and the fault lays with the small and elite group of families who rule this country with greed, prejudice, and determination to keep the poor in their place. I feel angry and frustrated, but simultaneously fueled by the fire to keep working to offer Guatemalan women a humanized birth experience. This is ACAM’s mission. We, as midwives, can fight against the power of a corrupt system— one birth at a time. The way we treat women in labor and birth impacts them for life. It affects their confidence, their identity, and their ability to parent. If mothers come out of their birth experience feeling demeaned or disempowered, then the entire family suffers. If they are supported and honored for their inherent strength and ability to create life, then they are transformed. In a society where women are often abused, ignored or denied an education, it is profoundly important that they feel valued in a moment as transformative and vulnerable as their child’s birth. We spoke with Elsa’s mother this week and she informed us that Elsa is now home and recovering. She lost a lot of blood during her delivery, which is a risk with preeclampsia. Elsa stayed in the hospital for nearly a week due to her hemorrhage. Her mother told us they were planning the baby’s burial service for this week.